Private companies took public money to house asylum seekers behind distinctive red doors and make them wear bright shiny wristbands. Twice in one week the abuse experienced by people seeking asylum from private contractors made the headlines. 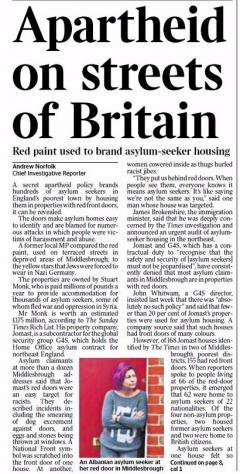 On January 20th The Times front page described "asylum apartheid" with the doors of asylum tenants in the north east painted red, marking them out for racist attacks. "Private companies shouldn't be allowed to profit from refugees," local MP Andy McDonald told parliament. Days later various reports — BBC, Guardian — described how asylum seekers were forced to wear visible wristbands as they queued to receive meals at Lynx House Initial Accommodation in Cardiff. Again this visible stigma marked them out for racist abuse and caused what one man described as "mental torture". In both cases these practices were enacted by private companies — Jomast and G4S in Middlesbrough, Clearsprings in Cardiff — on the Home Office asylum accommodation contract known as COMPASS (Commercial and Operational Managers Procuring Asylum Support Services) . In both cases the courage and determination of asylum tenants to speak out has challenged this discrimination and abusive treatment. Jomast have agreed to repaint the doors various colours. Clearsprings (formerly called Clearel) have been forced to scrap their wristband branding system. The "red doors" issue has been known about for 3 or 4 years, but Jomast, G4S and the Home Office have done nothing about it. Meanwhile tenants have suffered years of racist attacks, compared by one to the torture he suffered in Sudan. "I experienced an arson every single night behind my property" Abdul Al Bashir told the BBC. 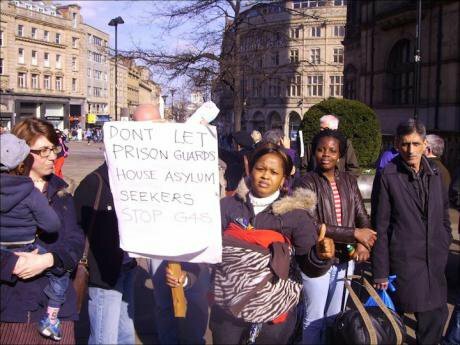 South Yorkshire Migration and Asylum Action Group (SYMAAG), along with local campaigners raised it with G4S in 2013. Nothing was done, despite it being raised with G4S in a Parliamentary enquiry that we called for. We believe these abusive practices — whether designed to stigmatise or just the result of incompetent neglect — are not isolated features but arise from the nature of the privatised COMPASS asylum accommodation contract. When SYMAAG met G4S executive Stephen Small in 2012 he was being honest when he explained that G4S' "primary concern" was to "make a return for our shareholders in the asylum market". There’ve been consequences for asylum tenants of living, not in a home, but in an "asylum market": asylum tenants tagged; forced to share a bedroom; disabled asylum seeker told to "crawl" to upstairs bathroom; tenants victimised for speaking out; housed in cockroach and rat-infested houses; female tenants denied privacy; pregnant women evicted as they were about to give birth; young mothers and babies forced into an overcrowded, disease-ridden hostel (Jomast again). With asylum tenants, John Grayson has led the work of documenting the reality of privatised asylum housing, particularly G4S and its dwindling number of subcontractors. But it's not just G4S. The the other COMPASS contractors, Serco and Clearsprings (closely connected to Capita), are responsible for a lot of misery in the lives of asylum tenants. Before the COMPASS contract began in February 2012 asylum housing was often inadequate and sometimes totally unacceptable. But with COMPASS — the biggest ever single Home Office contract, potentially worth over £1.7billion over 7 years — standards have gone through the floor. "Unacceptably poor" was the verdict of the Public Accounts Committee's investigation. Since profit has been the "primary concern" of the contractors the lowest cost housing has been sought out. By definition this is in the most deprived ex-industrial areas of the country where hardship can easily breed desperation, competition for inadequate resources and services and racism. This isn't to label Middlesbrough, Hull, South Wales or South Yorkshire as irredeemably racist - there's some great solidarity work from local communities and trade unions - but dumping refugees into already deprived and ravaged communities is likely to create problems, without increased resources and support for all. In these circumstances branding asylum tenants with red doors and tagged wristbands isn't just degrading it's potentially life-threatening. Questions must be asked about why the Home Office and Government have failed to monitor the contract, standards of housing and regulate the dumping of so many asylum tenants in areas of high social deprivation. Was it all part of the Government's plan to create a "hostile environment" for undocumented migrants? Or neglectful incompetence with £1.7 billion of public money? The news that the renewal of the massively expensive COMPASS asylum accommodation contract is being discussed was sneaked out on Christmas Eve last year. These latest examples of inhumanity in the "asylum market" should — we believe — result in it being ended. G4S, Serco and Clearsprings/Capita should pay compensation to the taxpayer, to local authorities who have picked up some of the bills for their failures and to asylum tenants. Surely it is possible for asylum tenants, tenants' associations and local authorities to provide decent housing for people who have come to this country to escape abuse. Not to be caused more of it by private companies paid public money. Author's note: John Grayson worked with asylum tenants and Times reporter Andrew Norfolk to help break the "red doors" story. John wrote an analysis of Jomast's and G4S's red doors policy for openDemocracy on 22nd January here. For a comprehensive series of articles on asylum housing and G4S see here. To join the campaign to Stop G4S, get involved here. This piece is republished from the website of South Yorkshire Migration and Asylum Action Group (SYMAAG).